Helps prevent and improve stretch marks caused by diets, puberty, pregnancy or post-partum. Keeps skin healthy and firm and Suitable for all skin types. 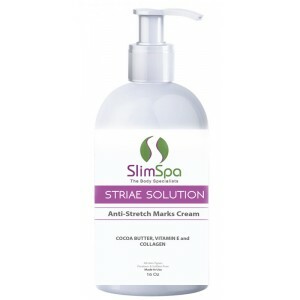 Striae Cream is formulated with three powerful ingredients that help keep your skin hydrated to prevent and fade stretch marks of the skin due to pregnancy, weight gain or loss. Collagen: Is a protein that binds skin cells together and keeps your skin supple. Using the cream addresses the collagen deficiency directly into the indented skin. Vitamin E: Supports new skin cell growth and revs up cell regeneration. This helps minimize stretch marks and reduce itchiness. Cocoa Butter: Is high in fatty acids, which is why it's often used during pregnancy because of its ability to hydrate and nourish the skin and improve elasticity. Purify water, Paraffinum Liquidum, Hexadecanol, Sorbitol, Cyclomethicone, Triethanolamine, Marine Collagen Hydrolysate, Cocoa Butter, Vitamin E, Fragrance , Sodium Chloride, EDTA, Methylchloroisothiazolinoine, Methylisothiazolinoine.